A new passion was discovered this week: Beading. I’ve always been partial to jewelry and have a good collection of bits and pieces I’ve accumulated over the years including stray beads and broken necklaces. I must have imagined that someday I might learn to string beads. Dateline 2010 – Jewelry making has been demystified! Better yet Trent is enthralled by the tactile nature of the beads and the colors and choices. Who would have ever guessed I’d be ready to haul out that collection and start stringing it up! We’ve made 4 bracelets, 2 necklaces and 3 pairs of earrings so far this week! Perhaps the most exciting part is Trent’s enthusiasm for this new medium. 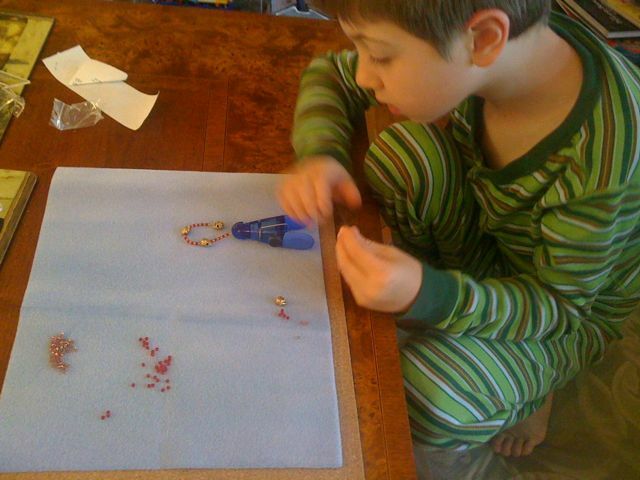 He hasn’t lost interest in glass at all, but he loves beading almost as much. He also seeing the parallels and is curious how to make beads. He’s also eyeing the hammers and anvils, so I expect silverworking may be next on our agenda. For the moment I think we’ll take this slowly and evolve with time. Look for us on Etsy sometime soon. Felting is the other tactile art we’ve been working with over the last month and again Trent is taken by the color and feel. I couldn’t believe how easy cookie cutter felting was. We’ve invested in some more roving and tools so I expect some cute critters to be born in the coming months. Meanwhile I’ve almost got the whole summer booked (I know it’s April). The activity and camp choices are diverse and exciting and the best ones fill up quickly. Looks like it will truly be a summer of adventure! Trent is thrilled to be going to a new location in San Francisco – A Curious Summer – I bet you can’t guess which session he chose! Baseball season had officially begun. We celebrated by attending our 1st A’s game in Oakland vs the Mariners. Then we drove home for Trent’s 1st game. He played 2nd & 3rd base. Trip Update: 10 hotels booked in 6 countries. Car booked. 10 restaurants booked. Trip is a go! We’re scouring websites and I’m noting exciting locales and dining spots along the way. I have 40 tomato plants begging to be planted… so maybe this week we will manage to get them into the ground. This week we’ll be tasting popcorn & lemonade for a 4-H project; helping to plan a party, talking about Charlie & the Chocolate Factory at Book Club, visiting the dentist and going to see the SF Symphony. Next > The Grand Adventure Part 1 – To Amsterdam & Beyond!